"Don't sweat the little stuff." 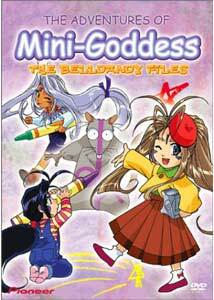 Disc two in The Adventures of Mini-Goddess bring another twelve installments in this "short" series to DVD. With their master Keichi out of the house, our trio from the Goddess Relief Helpline shrink themselves down to create mayhem and as much discomfort as possible for their friend, Gan-chan the rat. In fitting with the mini theme, these are all half episodes, though some are two-parters, or have carry overs to the next episode. The charm of this series is the personalities of its characters and the mischief they get themselves into. Urd, our eldest goddess, has a notion for potions, which aren't always put into practice in the intended manner. Skuld, the youngest, is the mecha queen, always coming up with some form of gizmo for a given situation, but again, her ideas are not always well conceived, leading to unforeseen and hilarious repercussions. Gan-chan, the trusty rat, has all manner of situations thrown at him, and more often than not, suffers as a consequence of our goddesses trying to help him. The soft spoken Belldandy makes a rare appearance, usually to inquire about the evening's dinner menu or to offer tea. In our first installment, Mini-Urd is put in charge of looking after Gan-chan's niece and nephews. However, her experience in tending a trio of tots is limited, and finding ways to manage them and keep them out of mischief is a challenge, but as a goddess, surely she can find some way of keeping these brats in line. She tells all in Urd's Babysitting Journal. Ah, love is in the air, as Gan-chan finds his heart's desire in the lovely Kaoru, but his skills at wooing could use a little assistance, especially when he decides to pop the big question. Determined to help the couple out, Urd concocts a magical spell with the rose of passion, an irresistible enticement for true love that no woman, or rat, can resist. So what could possibly go wrong with The Proposal Scheme? She cooks, she cleans, she does everything to keep her man (okay, rat) happy. Gan-chan has a new bride, but can they really be set for a life of domestic bliss? Skuld and Belldandy can't believe their eyes in Welcome, Newlyweds! In Phone Me, Darling, there is more than one way to skin a cat—or rat—when Gan decides to do some cleaning up. Ill advisedly, he asks help from our trio of goddesses, each of whom puts their own spin on the project. You'd think he'd know better than this by now. The first of a "chilling" two-parter, SOS in the Big Snowfield: Part One sees Urd heading an expedition across a frozen wasteland in a quest to conquer the unseasonable elements that have turned their living room into a winter wonderland. The battle to quell the air conditioner continues in Part Two, as the team scales a frozen precipice in a race against time—and Skuld's backfiring defense mechanisms. How will Gan survive? Next, Gan goes to the mat in Kitchen Fighters, as the Morisato Family Martial Arts Championship M-1 Grand Prix gets underway. The seats are packed, as each gym trots out the best it has. This is supposed to be a rat-only competition, but Skuld musters support for her late entry into the arena. This has gotta hurt. Ever wonder what a rat does when you're not looking? Get the inside scoop in Gan-chan's Magnificent Days, as Urd goes behind the scenes to determine just what their friend gets up to during the course of a day. I could go for something to eat! Our goddesses aren't really looking for Eastern wisdom when Urd brings a statue to life in Ah! My Buddha—but they are going to get some anyway, 'cause this pint-sized idol isn't monk-eying around. Was this really such a good idea? Gan-chan has found the perfect girlfriend in Koharu-chan—she loves everything he brings her. The question is whether her love is a little too all consuming. The goddesses find her reception to his gifts a little tough to swallow in The Story of Gan-chan: Love Me to the Bone. It's time to rock in this two-parter, as our shrunken comrades band together. On side A, Gan-chan wants in on the action when Urd and Skuld say Let's Form a Band! but who's going to play what?On side B, the group is together, but is the anticipation of their debut gig too much to handle? In all, another hilarious set of episodes. Plenty of action, mountains of mayhem and great comedic conflict between the characters as our tiny trio turn up the silly scale. If you are looking for deep, involved plots, or serious drama, go away! We're here to have fun! Image Transfer Review: Image quality is consistent with the first disc, just slightly on the soft side, but with strong colors and black levels. Some minor interlacing is about the only issue. Audio Transfer Review: Original Japanese and the English dub track are both clean with no signs of distortion or other technical deficiencies. There is appropriate use of the soundstage, and reasonable spectral coverage. Nothing much to complain about here. Extras Review: Extras include a two-screen character bio and eight-image art gallery for Gan-chan. Menus are still frames, with each episode having three chapter stops; I would have preferred if the names had been included here. Alternating English and Romaji subtitles are available for the closing theme, which has the credits in original Japanese. A clean end credit is available as an extra. The hard subbed English opening title is removed from episode 14 on, though episode titles remain. As the title would suggest, Belldandy is the featured character this time out, with a brief introduction on the back of the package , and a 1/1 scale mini-poster on the insert's foldover. Our review copy had a white Scanavo case this time, instead of black. Unfortunately, there are no English credits for either cast on the disc. This is one situation where shrinkage is good! Disc two takes us halfway through this "mini" series, as our mini-goddesses embark on another collection of adventures. Break out the crayons, this is too much fun!